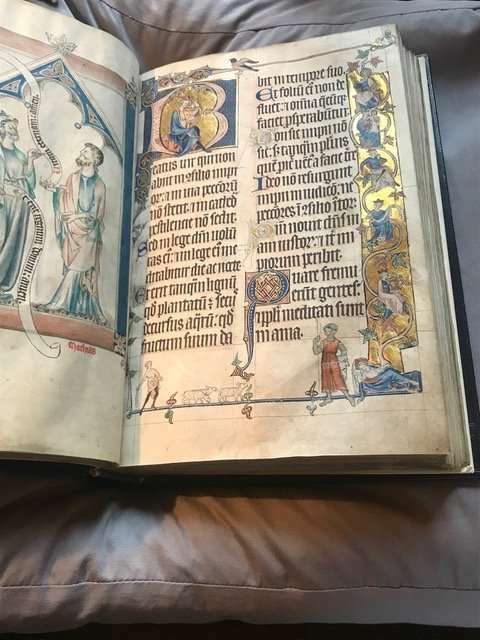 This post is a follow-up to my recently published blog, A Visit with Some Manuscripts at the British Library. 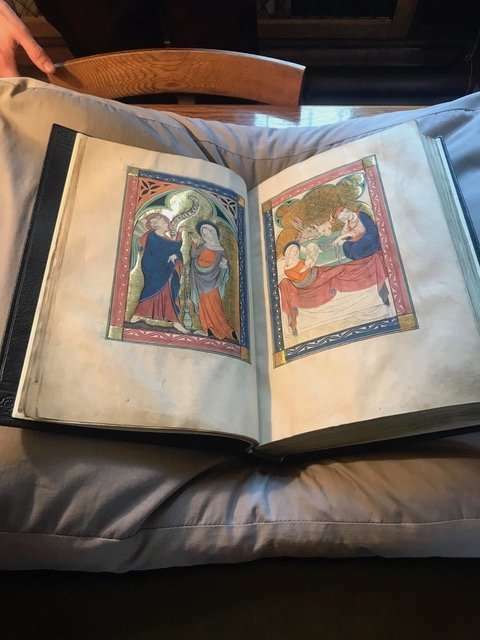 It’s the continuation of the chronicle of a trip recently offered by The Abbey Studio to London and Cambridge to view manuscripts and to participate in a workshop conducted by Patricia Lovett. A third blog is a description of the workshop. After a few surprisingly glorious, warm and sunny days in London, we headed to Cambridge. There, a visit to the Fitzwilliam Museum didn’t disappoint! 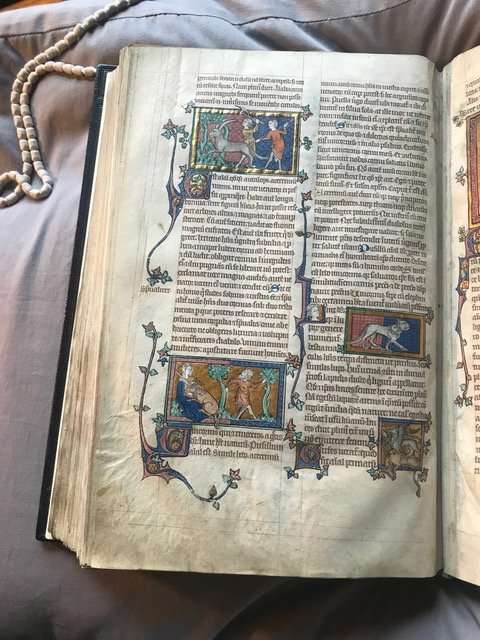 Among the many lovely manuscripts on display was the Vita Caroli Magni (Life of Charlemagne), created in Florence in 1461 and presented to Louis XI (photo 7). 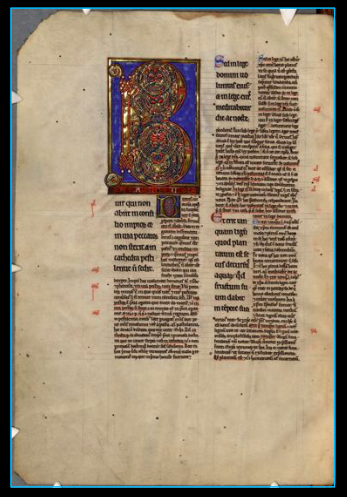 Unlike most existing medieval manuscripts, in this case we know the manuscript’s scribe and illuminator! The scribe, who was considered to be the best in Florence during this period, was Messer Piero di Benedetto Strozzi. The illuminator was Francesco di Antonio del Chierico, who was known to be the preferred illuminator of Lorenzo de’ Medici. 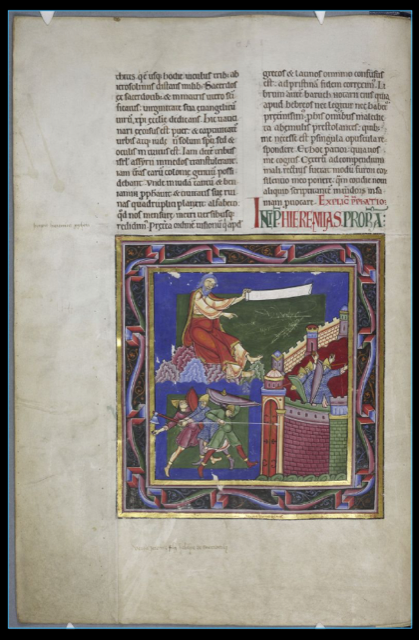 Another beautifully rendered manuscript on display was from the 10th century, an Epistle Lectionary (photo 8) containing St. Paul’s letters and complementary Old Testament readings. 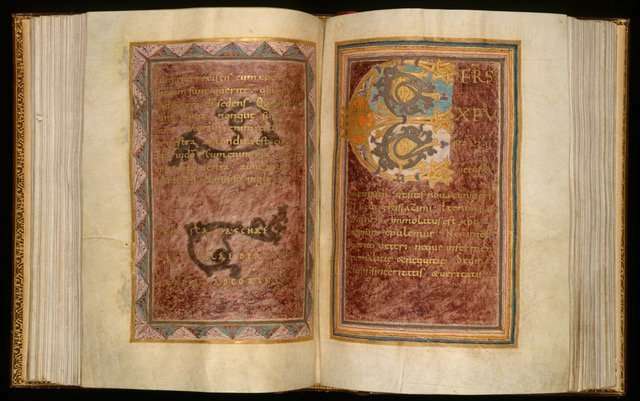 The text in this manuscript was often written in gold on a solid ground of purple, blue or orange. What an incredible calligraphic feat! And an utter delight for the eyes! Now, on to the Parker Library, which was the main event for this trip. 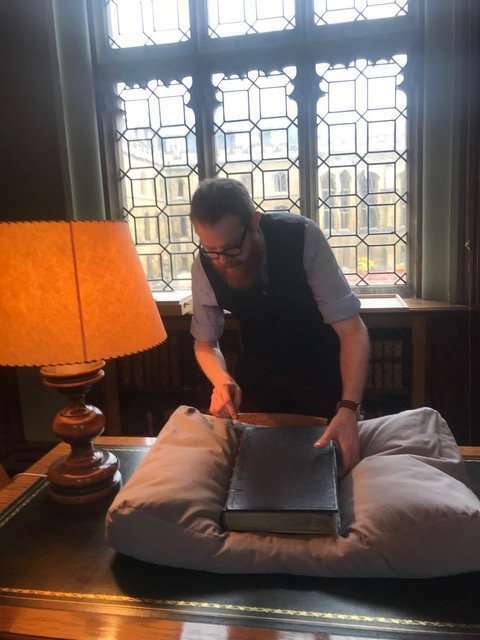 We were warmly welcomed by Dr. Alex Devine, Sub-Librarian at the Parker. The exhibit was comprehensive and had examples of vellum/parchment, tools such as a pricking wheel (see comments following) and plummet (lead point), and samples of the raw materials used to make the pigments, such as Malachite, Dragon’s Blood, Madder Root and Woad leaves, and, of course, some magnificent manuscripts. 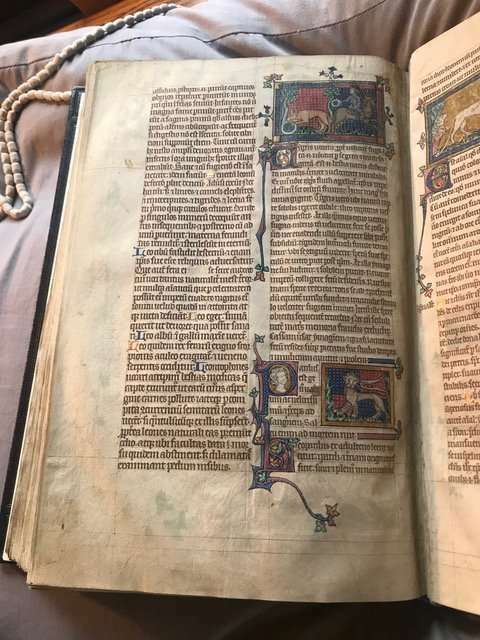 Among the manuscripts were the 12th century Bury Bible (photo 9), a glossed psalter from the 13th century (photo 10), and a pontifical from the 11th century (photo 11). 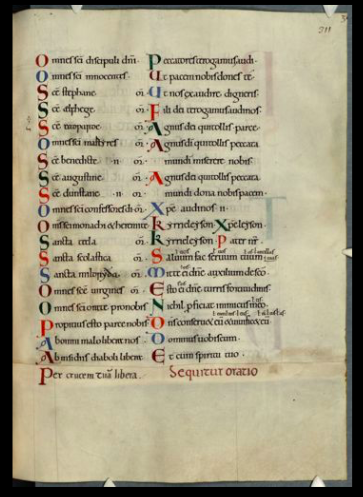 The term glossed refers to the commentary written in smaller letters around the larger, scripture text. And a pontifical is a book containing rites to be performed by the Pope or bishop. 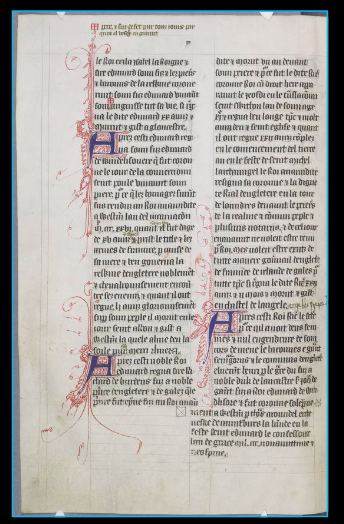 One very interesting aspect of one of the manuscripts on display, the 15thcentury Commentary on the Psalms (photo 12) is the evidence of the small holes used by scribes to line up the blank folios before beginning their lettering. If you look closely at the right side of the page in the photo, you can faintly see a series of holes running vertically near the right edge (in this particular example the row of holes has a bit more curve than usual). The scribe would run the pricking wheel (also known as a parchment runner) up the folded group of folios (called a signature or quire) near the right edge of the folded group of folios to make a series of tiny holes. He would then use an awl to pierce the entire stack of folded vellum where the pricking wheel had left its marks, creating a series of holes on both page edges (since the vellum was folded into folios). When the folios were opened, the scribe could use a straight-edge positioned between corresponding holes on the right and left edges of each individual folio to rule a series of lines for his lettering. 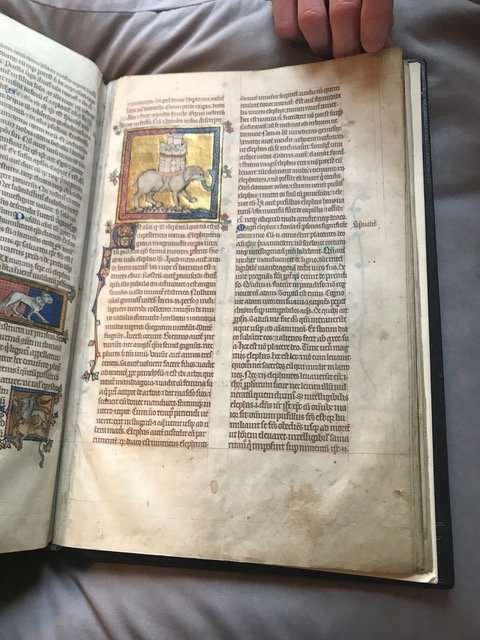 Much to our delight, Dr. Devine presented us with an opportunity to see first-hand the Peterborough Bestiary, which was to be the source of our images for the workshop with Patricia. What a thrill! But we must begin with a little history. 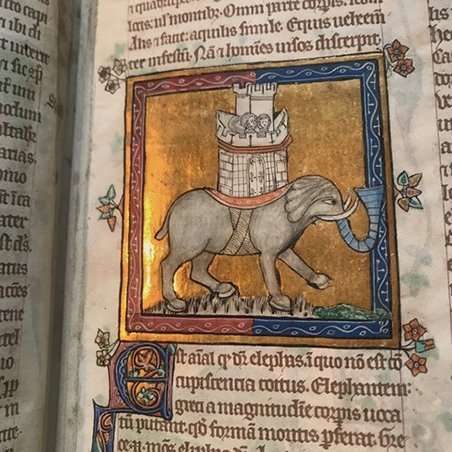 A bestiary is a medieval book about animals – some real, some imagined. 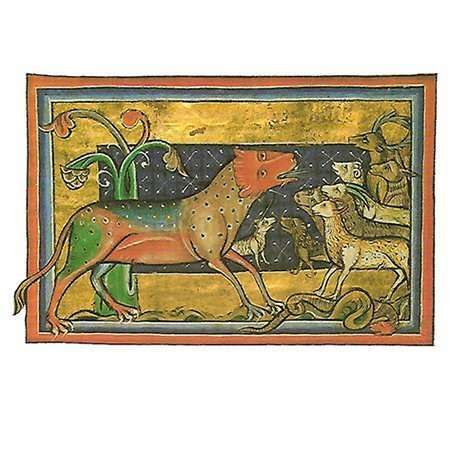 A painting of each animal is included in the bestiary and it gives a description of the animal’s characteristics. When read by the modern eye, they can be quite interesting and even funny as some of the descriptions are completely contrary to what we know about the animal today – if the animal even exists! 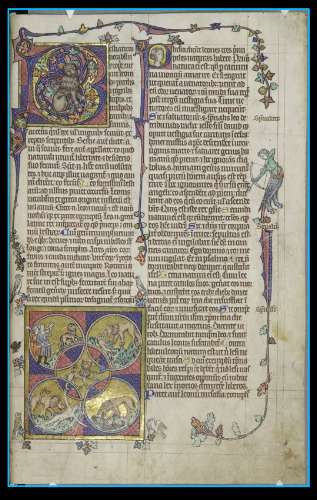 The Peterborough Bestiary is actually three books bound into one. 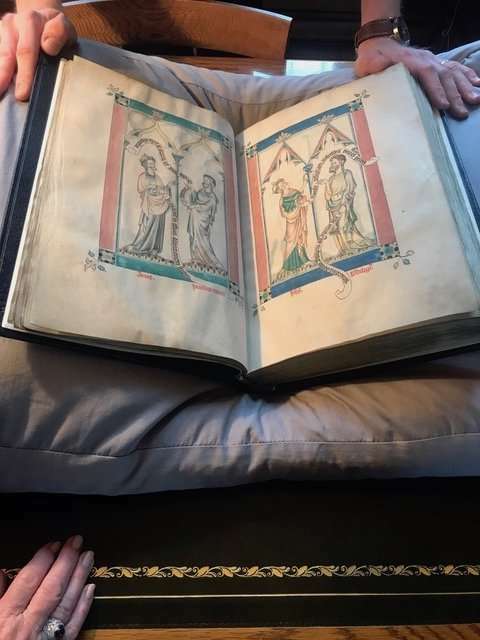 The first part is a psalter, and makes up about two-thirds of the book, the second and briefest part of the book is a chronicle or record of early England, and the third section is the bestiary. 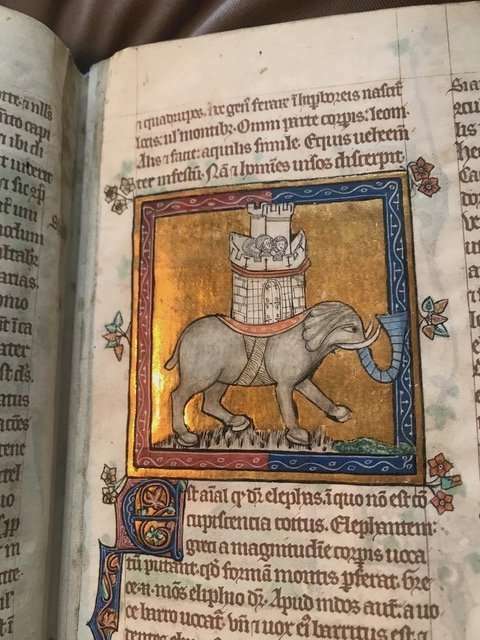 It’s interesting to note that when Matthew Parker, for whom the library is named and whose collection was the foundation of the library, purchased the bestiary he was only interested in the smallest section – the one on early England. But lucky for us they came as a package deal! 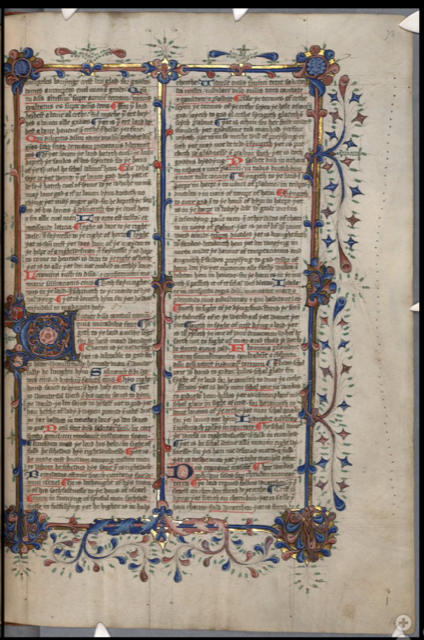 Take a look at Dr. Devine preparing to open this glorious volume for us to feast our eyes! (photo 13). 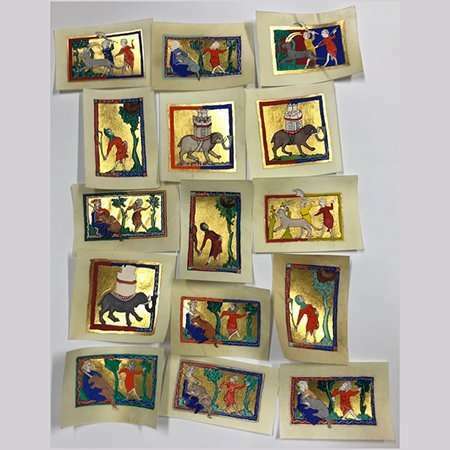 Photos 14-16 are from the psalter section. 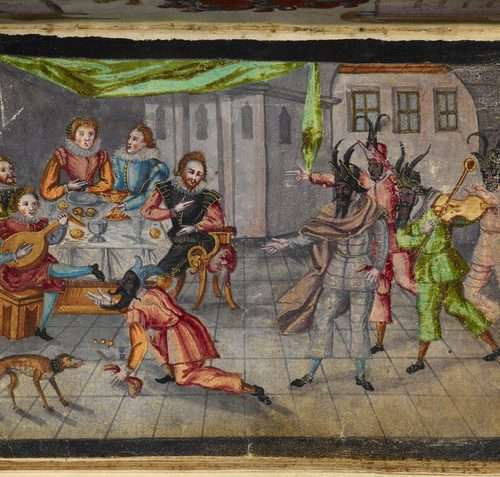 Photo 17 is a page from the English chronicle, (which, incidentally, includes the coronation of Henry IV). And finally, we get to the bestiary (photo 18) on 189r, nearly 400 pages into the volume! 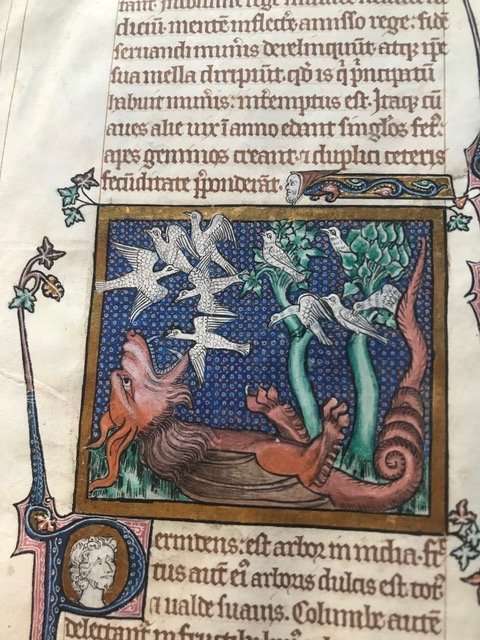 Enjoy perusing photos 19-24, showing some details of the Peterborough Bestiary! 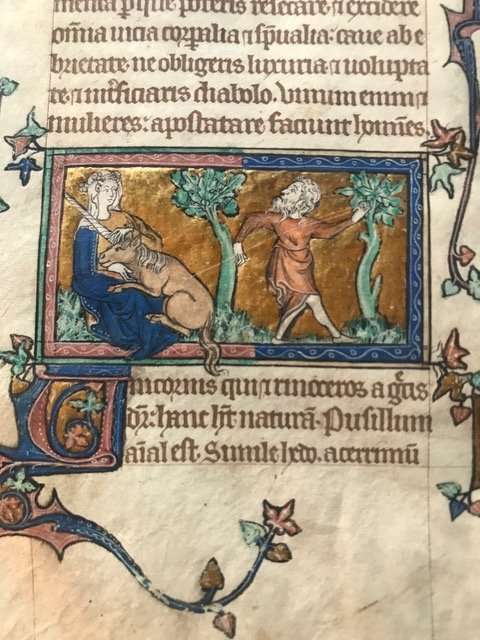 Fortunately for everyone who is interested in illuminated manuscripts, many museums and libraries have digitized their manuscript collections; this is the case with the Fitzwilliam Museum (http://webapps.fitzmuseum.cam.ac.uk/explorer/index.php?qu=manuscript) and the Parker Library (https://parker.stanford.edu/parker/). 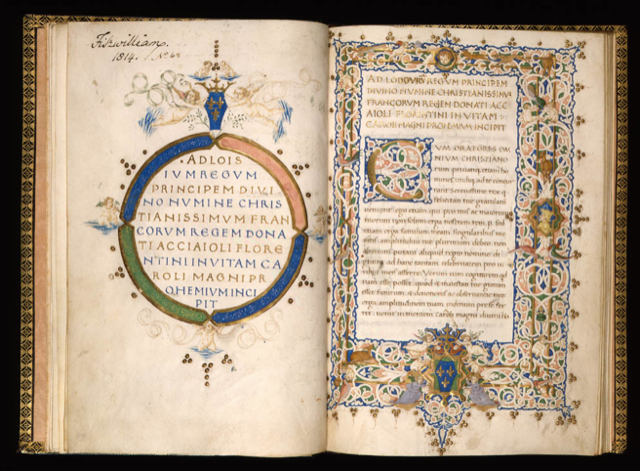 Nothing can replace the thrill of seeing these beautiful manuscripts first-hand, but it’s a wonderful resource that is available to anyone who has access to the Internet. Click here for the next blog post in which I describe the workshop with Patricia Lovett.